Long before the first Quaker set foot on Quaker Hill, the Mohican Indians came each spring and summer from nearby Connecticut and elsewhere to plant corn, gather berries, and to hunt. Although their tribes did not live locally and they themselves were transients, it is known that they buried those who died during their sojourns in at least one burial ground on Quaker Hill. In the 1700's, when the first Quakers settled in the area, they established their farms, raised their families and buried their dead in small cemeteries usually set aside and located on their property. Below is a historical account of the Quaker Hill Burial Grounds. David Akin, his wife Sarah and all of their children moved from Dartmouth, Massachusetts to Quaker Hill in 1741. As with many of the early Quaker families they established a family burying ground. This was located on their property near the Akin Library site using unlettered field stones. 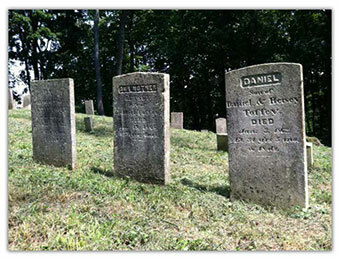 Between 1783 and 1805 lettered limestone headstones began to be used in burying grounds on Quaker Hill. Not all of the early Quakers were buried on their own land. When the first Meeting House of the Society Friends was built directly across from the present Meeting House and the Oblong Meeting began to meet there in 1742, a cemetery is believed to have been established slightly west of the House. Interments at the Taber Family Burial Ground. 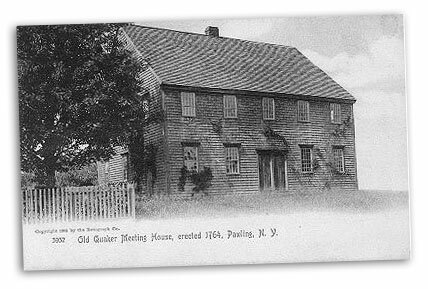 The Taber family arrived on Quaker Hill in 1760 and established a family burying ground which still exists on the original property on what is now North Quaker Hill Road. The first lettered stone was put in place in 1783 for Thomas Taber who died in his 51st year. The last of the 17 stones was for Elizabeth Taber in 1874 who died at the age of 39. In 1965 the Taber family legally arranged for the Quaker Hill Burial Ground Association, Inc. to have jurisdiction over the land, and to maintain this cemetery in perpetuity. The present Meeting House, built in 1764, served as a hospital for General George Washington’s troops, and those who died there in 1778 and 1779 were buried across the road in a burial ground to the east of the first Meeting House. This area is now marked with a single memorial stone. 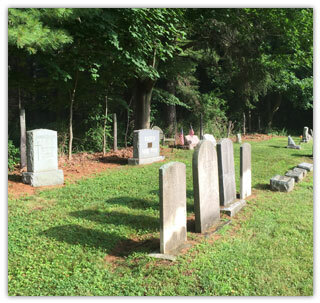 A second cemetery under permanent jurisdiction of the Quaker Hill Burial Ground Association, Inc. is the Akin-Toffey Burying Ground on the Valley Farm on Kirby Hill Road behind the Akin Library. This is on the original farm of Judge Albro Akin, the father of Albert J. Akin the builder of Akin Hall, Mizzen Top Hotel and Akin Library. Interments at the Toffey Family Burial Ground. This should really be called the Toffey Burying Ground as the only “non-Toffey’s” of the 17 people who were buried there were Timothy Akin, who died in 1846, aged 95, and Egbert A. Haviland who died in 1900, aged 68. However, they were all related as 3 Toffey men married Akin women. The earliest stone was for George Toffey, who died in 1814, aged 31. The first Toffey to come to Quaker Hill was John Toffey, a hat maker, who married Abigail Akin in 1776 and lived where the present Manse of Christ Church is located. Per the head stones he died in 1825 at the age of 80 and Abigail died in 1829 at the age of 76. The last stone was for Ann Akin Toffey Hayes who died in 1901 at the age of 79. Directly east and connected to the Akin-Toffey Burying Ground is a small hill next to Brady Brook which holds some 40 graves marked only with fieldstones. It is thought these may be the graves of earlier Akin family members and other early Quakers. Waite Vaughn, a notorious robber and murderer during the Revolutionary War was buried in an unmarked spot outside this burying ground. Due to the legal and practical limitations of establishing family burying grounds on private property, Albert Akin established a prominent Akin family section in the large Pawling Cemetery on Route 22. His father Albro and his first and third wives and a number of children are buried there. 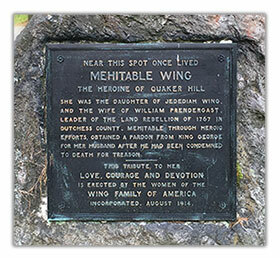 (His second wife, Sarah Merritt Akin (1788-1817) is buried in the Quaker Cemetery). His son Albert and his wife Jane are also buried there in the Akin mausoleum. There are a total of 41 people buried in the Pawling Cemetery with the Akin name. Nearby are the graves of Admiral John Worden of Civil War fame as captain of the Monitor and his wife Olivia Toffey, whose parents, grandparents and aunts and uncles are buried in the Akin-Toffey Burying Ground. Interments at the Akin Family Burial Ground. About 1800 Jonathan Akin (1737-1828), the youngest of the 10 children of David and Sarah Akin, purchased the land now called Clover Brook Farm located on Quaker Hill Road below Cliff Drive and built the original house. He passed the farm on to his son Peter (1771-1860). Peter passed the land on to his son Issac (1814-1863). Issac did not have children and bequeathed part of his farm and dwellings to his nephew Martin Leach and to Martin’s sister Lillius C. Leach, with the rest of his estate passing to his nephew, Jonathan Akin. Near Clover Brook Farm, located on Quaker Hill Road is the small Akin-Leach Cemetery clearly outlined by stone walls. Nearby is a large stone with a bronze plaque, which was erected to mark the Oblong, a disputed strip of land between New York and Connecticut. This strip was ceded to New York in 1731 in exchange for what is now Fairfield County. The resolution of this land dispute opened the Oblong for permanent settlement and the Quakers responded. Issac Akin had accumulated a quantity of rough stones designed to be tombstones, and specified in his will that they be dressed and lettered in plain and comely manner and that they be set appropriately at the graves of the respective persons in his family’s burying ground. Issac is buried there as are his parents Peter and Abigail and his grandparents Jonathan and Lillius, and other family members. Martin Leach sold his property in 1910 to Benjamin B. Hampton excepting the burying ground located thereon. When he died in 1912, Martin Leach bequeathed to his executors the sum of $700, the income from which was to be used for the care and maintenance of the Akin Leach Burying Ground located on the farm he formerly owned. Martin Leach also directed his executors to pay this sum to any Cemetery Association that might be formed to take over the Quaker Cemetery near the residence of William H. Osborn upon their agreeing to carry out this trust. In April 1921, the Trustees of the Quaker Hill Burial Ground Association, Inc. agreed to accept the terms of this trust, along with the sum of $702.07 (being the original $700, plus accumulated interest). The first named headstone was for Peter Akin who died in 1805 at the age of 10 months. The last headstone was for Martin Leach who died in 1912. Interments at the Quaker Hill Burial Ground. In 1855, Richard T. Osborn deeded to the Society of Friends and their successors at an Oblong Monthly Meeting approximately one acre of his farm. This one acre is now the Quaker Cemetery on Quaker Hill Road. The Society of Friends had for many years buried their members there, but they also included a section for the free burial of those early settlers approved at the Oblong Meeting, but who were not members of the Meeting. 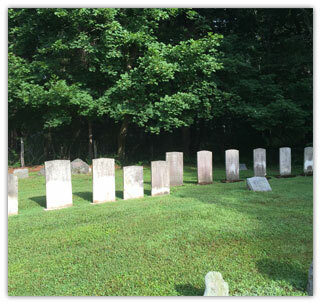 The Quakers were buried on the south portion of the cemetery and the others on the north side. A low metal rail fence separated the two sections, but has since been taken down. The earliest burials in the cemetery, marked by gravestones, are those of Nehemiah Merritt, Phoebe Merritt, William Pitt Merritt and Anna Merritt (the last of three children of Daniel Merritt, son of Nehemiah) in 1794. It is known that Mary Dingy Merritt, the second wife of Nehemiah, died before 1761. She was probably buried in this old Quaker burying ground as were many members of the Merritt family buried there in the early to mid 1800’s. Also buried in this old Quaker burying ground are such early settlers as the Havilands, Shermans, Hoags, Posts, Osborns, Wings, Briggs, Wanzers, Howards, Straights, Whaleys, Tabers, Aldriches, and others. It is said that one of the earlier settlers was buried with his pet parrot on his chest. Also located in this cemetery is a memorial stone to Mehitabel Wing, whose exploits during the Revolutionary War are recounted on a bronze plaque affixed thereon. In 1899, this one acre cemetery was officially approved by the Town of Pawling and transferred to the Quaker Hill Burial Ground Association, then being formed through its Board of Trustees. In 1916, the Quaker Hill Burial Ground Association was legally incorporated under the laws of the State of New York, Division of Cemeteries. 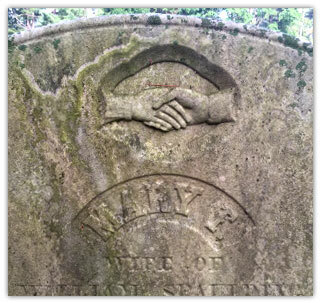 In 1917, at the Monthly Meeting of the Society of Friends, the Oblong Meeting officially deeded their burying ground, more fully described above, to the Quaker Hill Burial Ground Association, Inc., that it might have proper care. Present at this meeting were William H. Osborn, Mary Elizabeth Hoag and May Hoag, Trustees of the Association. At the same meeting, the Quakers authorized the sale of their Meeting House and lot with the sum of $500 to be given to the Association, the income from which would be for the upkeep of this Friends Burial Ground. This amount was received by the Association in December, 1934. During the 1940’s through the 1970’s, more and more of the long time residents of Quaker Hill applied to the Trustees of the Association for burial plots in the Quaker Cemetery (a bronze plaque with this name inscribed is mounted on the cemetery’s stone retaining wall). By using what had been designed to be driveways, trimming encroaching bushes, and permitting two cremated burials per plot, the Trustees were able to meet this demand. Fortunately, one of the Trustees, Dr. Ralph C. Lankler, who for many years was the Christian leader of the Pawling Community and was pastor emeritus of the Christ Church on Quaker Hill, foresaw the need for a larger burial ground to accommodate not only the residents of Quaker Hill but also the Village of Pawling and the surrounding community. His vision was to provide a service to all people that would meet their needs for more than a century, as the earlier farsighted Trustees who founded the Association had done. 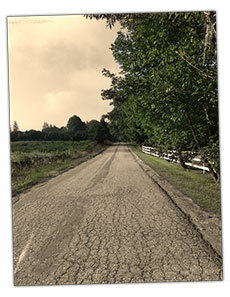 Many avenues were explored but turned down for one reason or another. In 1989, the property of Mr. Nils Djernas, located on Church Road beside and adjoining the Akin Hall Association property upon which stands Akin Hall, more commonly known as Christ Church on Quaker Hill, became available. Dr. J. Marshall Hoag, President of the Quaker Hill Burial Ground Association, Inc., appointed a committee comprised of Dr. Lankler and Raymond A. Schroth, Trustees, and Col. Oliver Porter, a member, to look into the acquisition of the Djernas property. Largely through their efforts this property, being some seven and a half acres, with a house and garage, was acquired and laid out as a new cemetery. Contributions to purchase this property were made directly to the Association and through the Akin Hall Association. The purchase price was $125,000. The Quaker Hill Burial Ground Association, Inc. contributed $25,000 of its own funds and Mr. Lowell Thomas, Jr. contributed $50,000. Other individual contributors were assigned one burial plot in this new cemetery for each $500 that was contributed. At 3:00PM on Sunday, October 29, 1989, this new cemetery, which was named Quaker Hill Cemetery, was dedicated at a service held there. The location of the Quaker Hill Cemetery, being adjacent to Christ Church on Quaker Hill and overlooking the Harlem Valley, has attracted a large number of residents in the Pawling community. Among them is Dr. Norman Vincent Peale, eminent preacher and author of The Power of Positive Thinking. He was pastor of Marble Collegiate Church for 52 years, and with his wife Ruth Stafford Peale, co-founder of Guideposts Magazine. Subsequent to the establishment of the Quaker Hill Cemetery, the Akin Hall Association deeded to the Quaker Hill Burial Ground Association, Inc. the approximately 14 acres adjoining this property to the south. Of this a small strip was returned to the Akin Hall Association at the time the Francis Ryan Thomas building and Lankler Hall were added to Akin Hall. On the Akin Hall property beside Christ Church on Quaker Hill is located the large Thomas rock. 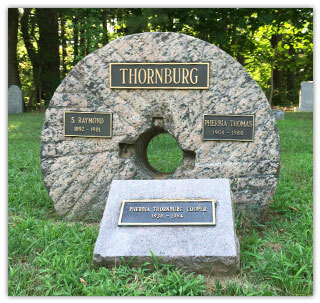 Lowell Thomas, world famous newscaster and author, and his wife Francis Ryan Thomas are buried by that rock marker. Also on Akin Hall property, adjacent to the church, is a stone with a plaque attached memorializing Governor Thomas E. Dewey and his wife Frances. They are interred in a mausoleum in the Pawling Cemetery but attended Christ Church for many years. Maintenance of the five cemeteries under the jurisdiction of the Quaker Hill Burial Ground Association, Inc. was always a problem. The Tabers cared for their own cemetery. 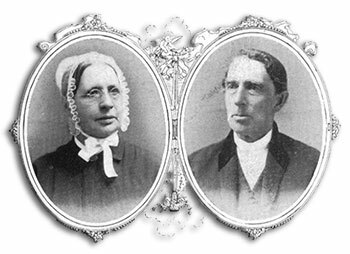 Emerson Ives and Archibald McLean, who had houses nearby, occasionally cut the grass of the Quaker Cemetery. The Akin-Leach Cemetery was occasionally trimmed by the residents of Clover Brook Farm. The Akin-Toffey Cemetery remained unattended for many years and became overgrown with trees and bushes. It was not until 1977 that the Association was able to maintain all five cemeteries on a regular basis. In 1989, an arrangement was made to have a caretaker live in the house on the Quaker Hill Cemetery and maintain the cemeteries. Over the years, the Quaker Hill Burial Ground Association, Inc. has received many contributions and has been able to improve and care for the five cemeteries under its jurisdiction. The driveway has been black topped at the Quaker Hill Cemetery. Stonewalls have been rebuilt at the Quaker and Akin-Toffey Cemeteries. Brush and many trees have been removed from on and around the Akin- Toffey Cemetery. Gates have been refurbished at the Quaker and Akin-Leach Cemeteries. Stones have been straightened and repaired at each cemetery. Many fallen trees and branches have been removed. The grass is cut weekly during the growing season.